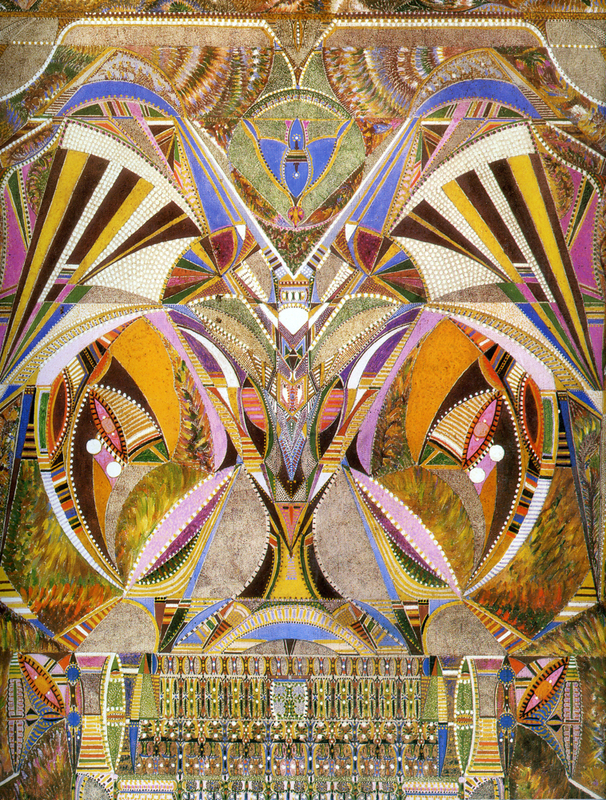 Last week I was pointed in the direction of some paintings by French Spiritualist artist Augustin Lesage (1876-1954). Lesage is one of the most fascinating figures associated with Art Brut, yet I can’t find an English bio for him anywhere on the web. The one on Wikipédia Français is fanciful, but it sure makes me want to believe every word! The voices you heard were real. You will be a painter. Fear not, and heed our advice. You will find it ridiculous in the beginning, but we are the ones tracing through your hand. Do not try to understand. The voices proceeded to tell him which colors and brushes to buy, and where to order a canvas. Lesage ordered a small canvas, but when it arrived, it measured three meters square. He wanted to cut it into smaller pieces, but the voices stopped him. 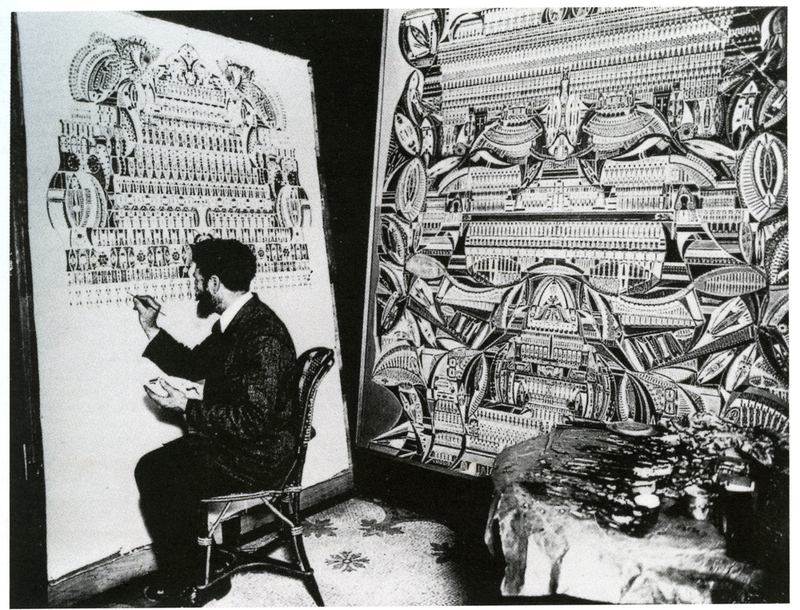 Augustin Lesage in the studio. For the next two years, he came home from the mines every night and went to work, letting the spirits guide his hand. He began in the upper right corner and gradually filled the entire canvas (which is now in Jean Dubuffet’s Collection de l’Art Brut in Lausanne). The composition was built by filling in small areas at a time. The spirits did not let him evaluate the work in its entirety: part of the canvas remained rolled as they guided his hand. “It was like working without working,” the artist recalled. 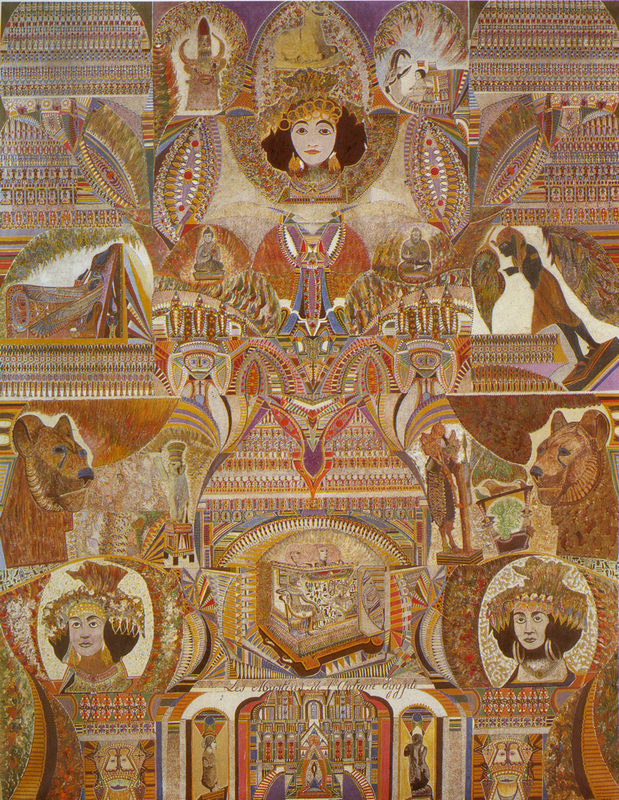 Augustin Lesage. Oil on canvas, 1926-1954. In July of 1913, Lesage interrupted his work in the mines to do some faith healing; a move that got him in hot water with French authorities who charged him with illegally practicing medicine. The testimony of his dozens of successful clients helped acquit him in 1914 and later that year he was deployed for WWI, where he continued to make drawings on postcards. In the years following the war, Augustin Lesage was visited by Jean Meyer, director of the Spiritualist journal La Revue Spirite. Meyer became his patron, and in 1923 Lesage was able to quit working in the mines and devote himself to painting. Augustin Lesage. Title not known. 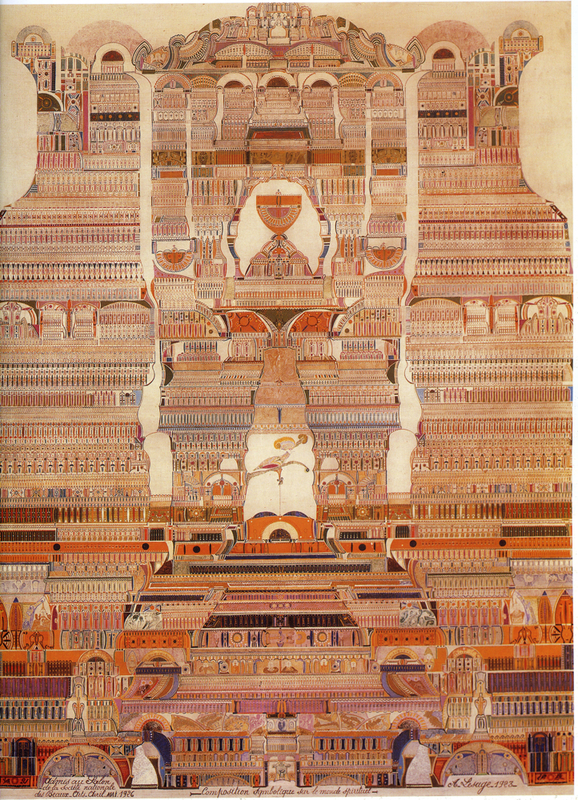 The first large painting of Augustin Lesage is one of the most daring in modern art. Although not, strictly speaking, non-figurative (figures both architectural and anthropomorphic abound), it explores almost all possibilities of abstraction—lyrical as well as geometric—at a time when the latter, among professional artists, was still in its infancy. They are no less ornamental and decorative than the works of Kandinsky, Lesage’s spiritual contemporary. Indeed, is the distance so great between the the Theosophy dear to the Russian artist and the Spiritualism embraced by the French? The former hearkens to Rudolf Steiner, the latter to Léon Denis. Augustin Lesage. Symbolic Composition of the Spiritual World, 1925. Augustin Lesage’s “classical period” is the period between 1916 and 1927, when he painted his most representative works. A growing fascination with Egypt, natural forms, and the ornamental traditions of various cultures gave Lesage a newfound source of conscious influence, diluting the purity of his earlier compositions and creating images that appear more self-conscious and perhaps less directly inspired. Lesage continued painting until failing eyesight and health forced him to resign in 1952, less than two years before his death. Augustin Lesage. The Mysteries of Ancient Egypt. All images via Shawna-bo-bonna’s Flickr photostream. Thanks to Shaun Kardinal for sending me the images, via butdoesitfloat.com. ~ by emilypothast on June 23, 2009. Raw Vision might be a good source for learning more about Lesage, as well as seeing examples (in a high quality magazine) of his work. RV does a good job with more global coverage, and European self-taught / new invention artists are generally well represented. Thanks for commenting. You’re right, Raw Vision is an excellent resource, although to my knowledge, they haven’t run a full article on Lesage (A-Z index of artists and subjects from their back issues here). I did poke around a bit at your suggestion and found an essay about Art Brut and Psychiatry from RV#15, asserting that Lesage seems to have been suffering from schizophrenia (link here). If this is the case, it carries strong therapeutic implications for the creative act. Lesage’s mental illness, if you want to call it that, did not seem to impair his ability to function so long as he was creating the art he was supposed to create (at least there is no major “breakdown”). Also there is a little bit about him in John Maizel 1996, ‘Raw Creation’, Hiadon Press, London, p56. Not enough to warrant buying the book, although it is an excellent book. 2 others you will probably already know about but worth a mention as they fall into similar camps while making incredibly intricate work: Adolf Wolfli and Raphael Lonne. Just figured I would come out of the lurkness on this blog. Wow, this is fascinating. What an amazing person/artist/story. I would LOVE to see these paintings in person! Interesting, too, how some artists have been marginalized within art history. Are people fine with standard variations on “Crazy” (e.g. van Gogh, Munch, Degas), but scared away by Spiritual Crazy? Or maybe Lesage’s work was considered too decorative or unfashionable? Of course there is not necessarily a reason why some great artists are marginalized, but in the case of Lesage, you have to wonder. I’m enjoying seeing his influence on your work. Also, “The Mysteries of Ancient Egypt” makes me think of CocoRosie. Thanks for writing this, Emily! I’m enjoying seeing his influence on your work. Oddly enough, I only discovered Lesage a couple weeks ago! So there is no influence on my work…YET. Also, thanks for the John Maizels tip. I actually HAVE that book and haven’t cracked it for a long time…will do. I should have articulated it as more of a common ground than an influence. The connections are interesting! did I give you a John Maizels tip? well duh I just read the comment up there with the John Maizels tip. thanks for this great post! i linked to it on my blog. 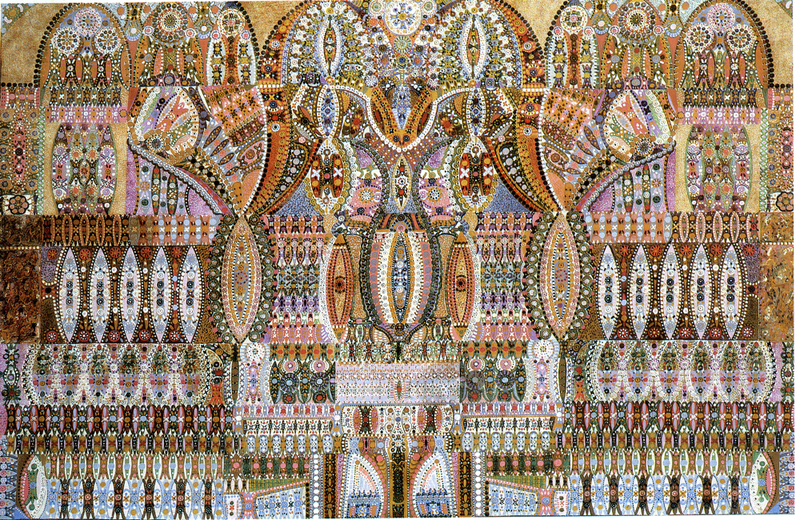 Here is a new french “Augustin Lesage”. amazing stuff. a friend linked me to the animations. google brought me here. thanks for the info ! Last august 2014 i was in Lille (France) in the museum of modern Art (Musée de l’art moderne: LaM) and saw for the first time the beautifull collection of L’Art Brut. I didn’t know anything about it. The first painting was breathtaking. Beautifull and impressive. 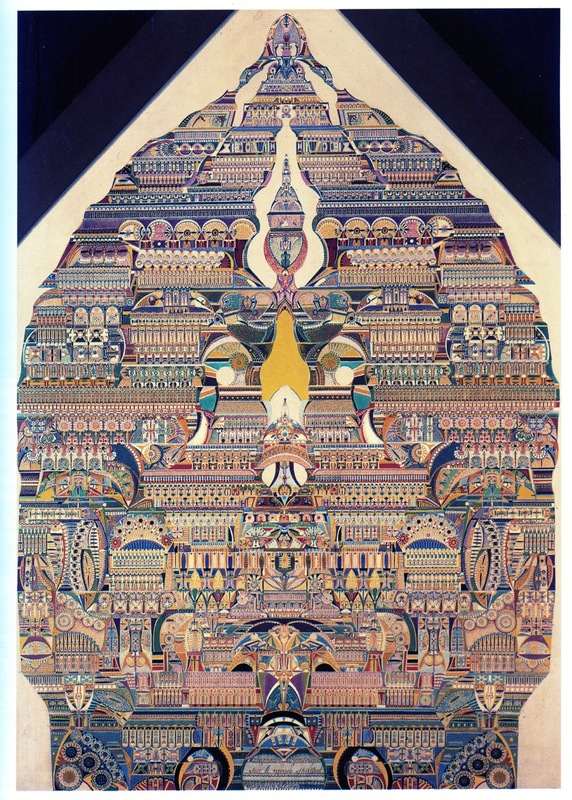 And not one, more then 10 masterpieces of Augustin Lesage. Two other painters, Victor Simon and Fleury Créton, also made a deep impression on me. And i had never seen it or heard about. It made my day, really! So now i started surfing on the web to learn more about them. Thanks for this website. Very interesting. And i like to read English more than French. I really empathize with being schizophrenic and having voices channel through you into artworks. I have spent hundreds of hours doing exactly that.